(usually barefoot) meg: What Is an Introvert? Introvert memes seem to be pretty popular these days. For whatever reason (perhaps the empowering nature of the internet? ), introverts are getting their message out there that they're OK. That, "just because I'm an introvert doesn't mean I'm broken." And I'm down with that. Really, I am. What bugs me... wait, let me restate that, what drives me absolutely batty, is when one of those memes makes a statement that such and such is true of introverts when it's not. It's true of some introverts, specifically introverted thinkers or introverted sensors or what have you. But it's not true of all introverts, and in fact, if you treat me the way that meme says you should treat me because I'm an introvert, I'll punch you in the nose. So I've made my own introverts meme. (OK, OK. So I've made one before. But I've made a new one. That's my point.) Because lumping all introverts into one box is what bugs me, my meme focuses on how not all introverts are the same. We come in four "flavors." What makes us all the same is that we all live mostly in our inner world. Once we're in there, though, we tend to focus on different things depending on what flavor of introversion suits us. There are four kinds of introverts. And not only that, but every extravert has an introverted side. So if you're an extravert and you're reading this thinking, "that sounds just like me!" That doesn't mean that you're an introvert. It just means you're identifying your introverted side. If you ever talk with typology geeks, you'll see them using terms like Si, Fi, Ti, and Ni. That's just shorthand for Introverted Feeler or Introverted Thinker, etc. 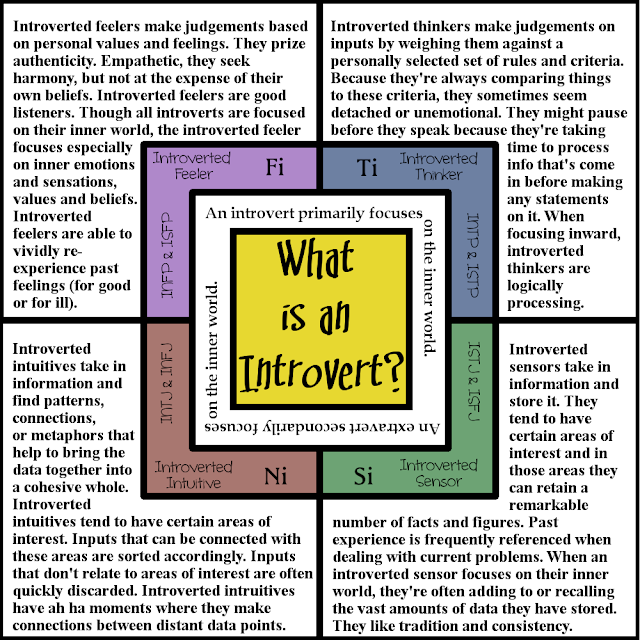 So how can you care for your introvert? Start by figuring out what kind of introvert it is that you're caring for. Then be sensitive to the preferences and peeves of that person's particular flavor of introversion. Ok, so now that I'm looking at this I see why I've felt so confused by the Fi/Si/Ti/Ni thing - how come for some types it's the third letter that is dominant and for some it's the second? You and I both share the first two, yet you as an INTJ are labelled as an Introvert Intuitive but I as an INFP am not. What's the deal with that? The J and the P tell you which of your two middle functions are extraverted. So you're a P, that means your second function (the N) is extraverted. I'm a J, so my third function is extraverted. But neither of us are extraverts which means our primary function is the opposite (so for me that's my second function, the N, and for you it's your third function, the F). am confused. are you saying that your intuitive function (as a J) is introverted and my intuitive function (as a P) is extraverted? what does that mean in practice? Yup, that's what I'm saying. I'm an introverted intuitive and you're an extraverted intuitive. When it comes to our intuition, I have depth, you have breadth. (You have depth when it comes to your judging function, which is feeling. I have breadth when it comes to my judging function, which is thinking. Depth is an introverted thing. Breadth is an extraverted thing.) So we both see things or experience things or hear things and then make connections. We see possibilities and ideas and patterns. But when I do it, it tends to revolve around some specific areas of interest. (Typology, community/housing issues/relational interactions, health/gardening/environment) When you are being intuitive, you're taking it all in. Your whole brain gets engaged in seeing, connecting, forming patterns, etc. That's why it makes sense when you joke about being easily distracted. That's classic Ne. Your awareness (perceiving) is always ready to take in something new. Mine, on the other hand, is only ready to take in things related to those areas of interest. I just don't have the bandwidth to deal with things outside of those areas (nor the interest). Oh good! I'm always kind of reticent to say "this is how you are" to someone based on their personality type because, for all I know, that's not how the person is. And since I don't see you in the "real world" I don't necessarily see you extraverting. But your pictures say a lot about you and that's helped me to get a better understanding of Ne. It's funny but Ne is one of the hardest functions for me to grasp. I think it's because I'm Ni so I assume it's got to be different than me, but I have no idea what that would look like. But as I see it in you and some of my other friends (especially my "real life" friends where I can see it in action) it's starting to make more and more sense. And that tunnel vision thing... that is SOOOOOOOO me. And it's not just an idea/inside sort of thing. I can't even begin to tell you how many times I've been walking somewhere or talking to someone and I didn't notice something RIGHT NEXT to the person I'm talking to or the place that I'm headed. It's like I have blinders on to everything except the person or thing that I'm focused on. People assume I'm ignoring them or being rude, but it's really that I honestly don't see them, even when they're just a few feet away. I'm starting to learn how to deal with it socially (acting more openly surprised when I DO finally see the person seems to help) but it's been hard because I don't even know it's happening and once I realize, I'm so shocked that I tend to go into myself instead of extending out into that newly discovered space. interesting, yes, I guess sharing my pics is a way I give people a window into my extravert side. I could pinpoint myself in the Extroverted post, but not Introverted. I guess closest is Fi. What are you? My primary function is introverted intuition. So I'm happiest when I'm seeing connections between things and fitting them together. I like when I'm working on finances when all the numbers neatly fall into place. I like when I'm working on formatting a newsletter or yearbook when all the pictures and text fall into place on the page. (Even when I have to squeeze new things in. It's the getting things to look like they were meant to be there, to see the connections and make them work, that I really enjoy.) When I'm thinking through an idea it's the moment when all the concepts fall into place and make sense in some interconnected way that I really enjoy. That's all Ni stuff. An INTJ is, in this order, an Ni, Te, Fi, Se. So I primarily work out of my introverted intuition mode. My Te is subordinate to my Ni. So, unlike my mom who is primarily a Te, I don't just jump up and start doing things indiscriminately because I see that they need to be done. I jump up and start doing things when they fit into the pattern of things that I've determined, using my Ni, to be important. Because I'm also Fi (which is subordinate to both Ni and Te) I tend to prefer having a closer collection of friends rather than going out and enjoying everyone I meet. But, like I said, that's subservient. So if there'a an event that relates to something my Ni is interested (Let's say I'm at a conference about personality types.) and I'm in a setting where I'm going around learning (Ni) and interaction with people (Te - which means it will be in a way to get things done, not to meet people) then my Fi (preference for a closer set of folks) won't make any difference because my Te is very happily meeting boat loads of people with information that feeds my Ni.